In 2011, the immigration law HB-56 was passed, and it caused a lot of problems for the Latino population of Alabama. As some Latinos fled the state, others came together to combat the prejudice against them. It was these groups’ lawsuits pressed that led to the dismantling of the harsher parts of the law. One group in Birmingham, Immigrant Alabama Movement (IAM) Birmingham, has taken a stance to help immigrants. Cesar Mata and Cindy Garcia are some of the community organizers for the group, which is made up entirely of volunteers. The group was founded in July 2011. There were many volunteers in the area wanting to help with the same thing and many people trying to find out more information about HB-56. The volunteers all got together to work for the same goal and IAM was created. The majority of the people the group assists are from Mexico, like Garcia and Mata, and other parts of Central America. 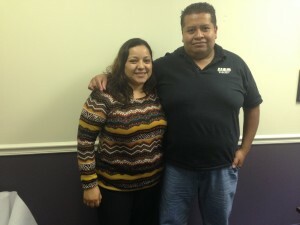 Cesar Mata and Cindy Garcia helped found the immigrant activist group, IAM Birmingham.